Redline incorporates racing into a sci-fi universe along with a bunch of aliens from other worlds. A bizarre combination like this can only give us a glimpse of what kind of anime this is. In other words, truly unique and different from the rest. I am a racing type fan who loves car racing games however its pretty rare to find an anime that solely focuses on street racing apart from Initial D. Redline on the other hand, is more of a sci-fi action orientated than strictly racing. The story is quite linear actually. A guy named JP strives to win an all-out tournament against rival members of other worlds in a illegal universal competition that will involve burning rubber, loaded weapons and dirty tricks. I found that the anime was more focused on the development of the characters and to the race itself rather than the story itself. I would say that this anime's art style is plain unique and interesting. 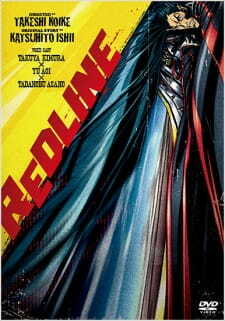 I have not seen an anime like Redline that have used comic-book style art with dark undertones and vivid shading and textures. It is truly bizarre and took a while to get used to. At first it may seem distracting, but somehow I accepted it in the end. I am not sure whether to like this type of art style or not as it is totally different from your average anime. Sound quality was excellent with the voice acting and various sound effects. This anime is all about the adrenaline and hype about intergalactic racing; as a result, sound effects are important here. Fortunately the producers made note of this and so every 'car' in the anime had its own unique sound and the weapons blasting and exploding is just satisfying to hear. The characters were decently bearable to an extent although some character's quirky visual appearances doesn't really match their voices. Its all good though because we're here for the action not the story. Character presentation gave me mixed reactions. Since this anime is set in a galactic setting, there were many bizarre and quirky characters from other worlds. I can't say I particularly liked them or hated them it was pretty much all a blur. The main character still keeps me wondering who he is and what kind of person he was. The anime does not got into much detail about the background information of any of the characters. So what you see on screen is what you should only know about them. There were however a couple of flashback moments that did give us a glimpse of the past but the rest is up to your imagination. Overall, since I am a racing genre fan, I say that I quite enjoyed this anime film although there wasn't much of a story and the art was truly unique. I can't say for sure if I liked the film or hated it. It was boring but there wasn't much development in story and characters. Perhaps it was just a nice film to just watch when you have free time. There wasn't much of a story to begin with except a intergalactic illegal street race. A truly bizarre art style chosen for this anime. I don't know what to say. Decent voice acting and superb sound effects. A wide range of truly weird aliens just kept me occupied. Its all about the fun- and none of the story matters when you got 'cars', 'guns' and 'nitro'. You have to be a racing fan to actually watch this anime film. Perhaps not suited for the average anime viewer.